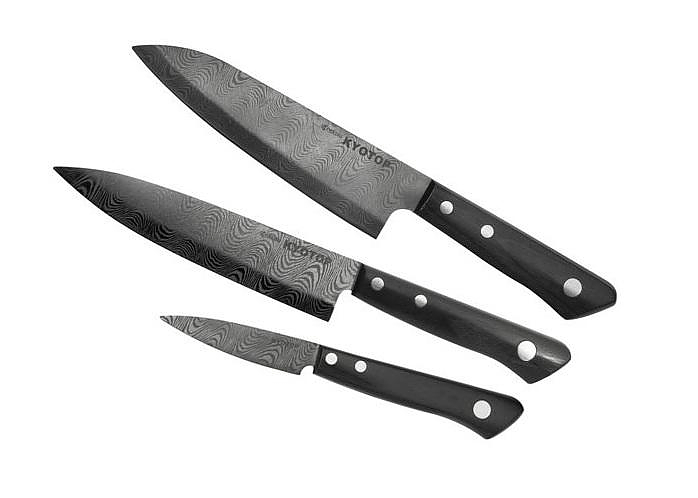 HomeBlogHome DecorKyocera Kyotop Damascus Sandgarden Ceramic Knives. 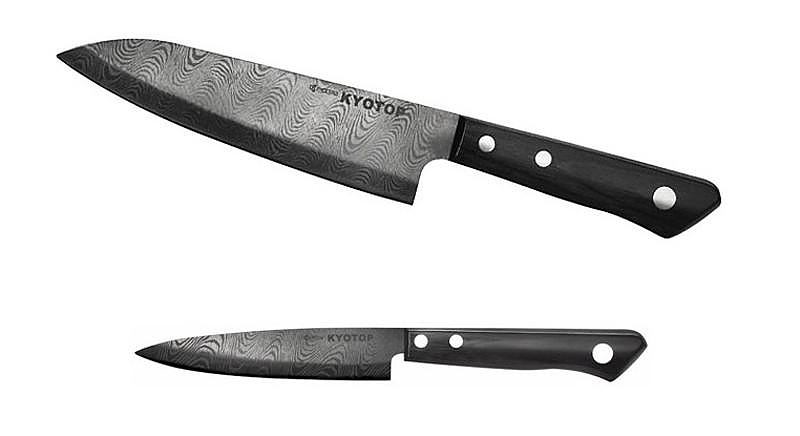 Kyocera Kyotop Damascus Sandgarden Ceramic Knives. The Kyocera Kyotop Damascus SandGarden series of ceramic knives are created with the harmony of Japanese traditional beauty and the high technology of Kyocera. Japanese Kyocera is one of the leading companies worldwide in the development of ceramic compounds and a pioneer in the manufacture of ceramic knives. 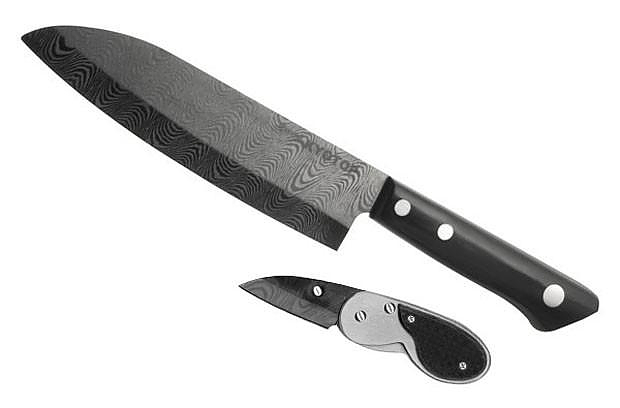 Having already in their range of products some of the harder knives of the market, it pushes the standards even higher with the Kyotop Sandgarden Damascus series, which is made from powdered zircon, pressed under 300 tons of pressure. This high tech blade construction process creates ceramic blades with a Damascus look and hardness comparable to diamond. The ultra-sharp, long-life blade holds its edge much longer than steel, doesn’t impart metallic taste or smell and is stain and rust proof. The diamond is known as the hardest material in existence. It may not be technically feasible to make real diamonds in a laboratory, but artificial diamonds are widely available. These are the well-known zircons, which are very close in hardness to real diamonds. 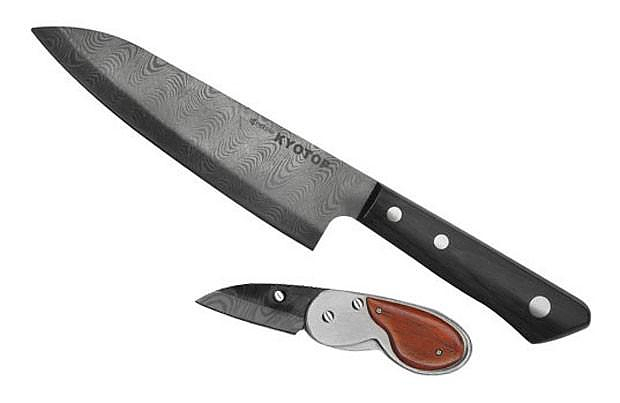 Zircons are usually used for jewelry, but Kyocera uses powdered zircon to build the hardest knives ever made. The result is a knife with minimum weight, which is incomparably sharp and does not need sharpening. In terms of appearance, high technology is in absolute harmony with the Japanese tradition. The classic shape of the handle is nicely tied with the black high tech blade, creating a familiar and at the same time futuristic look. The pattern on the blade of the Kyocera Kyotop Sandgarden Series represents KARESANSUI, one of the traditional styles of Japanese gardens which were established around the 9th Century. Among the various styles of Japanese gardens, KARESANSUI is a very artistic one which requires creativity and discipline. This traditional technique involves the carving of wavy lines, which are called “sand ripples” and symbolize the ocean and the fluidity of water. This garden style is typically found in Zen monasteries, and is primarily used for meditation. One of the most famous KARESANSUI-style gardens is in the Ryoan-ji Temple in Kyoto, well-known as the “Rock Garden,” and listed as a World Cultural Heritage by UNESCO. As the Japanese Gardens are characterized by precision and harmony in their design, the same applies to the Kyocera Kyotop Sandgarden ceramic knives. The blade is made with absolute precision and has several advantages over traditional steel, which constitutes them a precision tool in the hands of a chef. Most importantly the ceramic has far greater hardness than steel. As a comparison, a knife with hardness of 55 + in the Rockwell Hardness Scale is considered exceptional and cuts like a scalpel. The Kyocera Kyotop ceramic knives, while difficult to measure with this methodology, achieve hardness of around 70, which places them several levels above steel and much closer to diamond. As a result, they there is no need to sharpen them ever. At the same time, the ceramic will not impart any metallic taste, and is extremely resistant to all forms of chemical corrosion. Ingredients such as salt, oil or fruit acids will not corrode a ceramic knife. This means absolute hygiene as there is no conservation of smell. Finally, their small weight makes them very flexible to use for extended period of time. But although ceramic knives have a number of advantages, they also have some vagaries, which means that they cannot fully replace the famous metal knives and are more appropriate for certain tasks. Firstly, the ceramic is known to break, of course it is not as fragile as a plate for example, but if it falls or suffers percussion is likely to break. This feature also makes them unsuitable for cutting bones and other hard ingredients that require percussive movement. This is why there are still no ceramic cleavers. 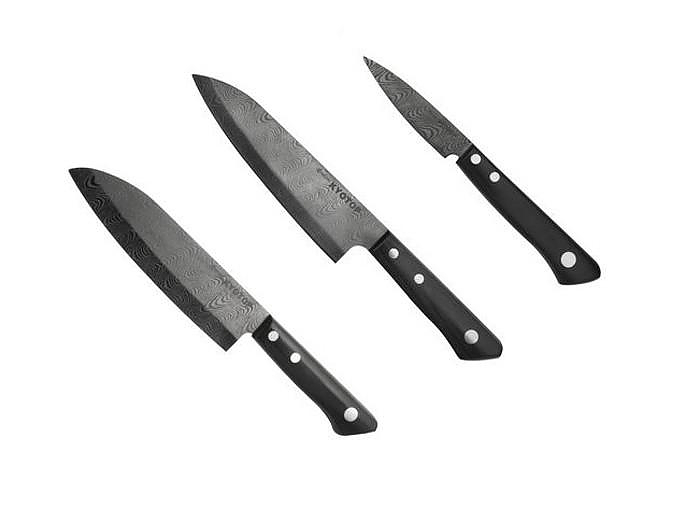 Finally, although theoretically there is never the need for sharpening (as previously mentioned), these knives are suitable only for cutting and not for percussion, so if you destroy them due to misuse there is no way to sharpen them again and your only choice is to send them back to the factory for sharpening through thermal processing. The Kyocera Kyotop Damascus Sandgarden Ceramic Knives come with a 5-year warranty and is made exclusively in Japan, on the island of Kyushu where Kyocera has has set-up one of the most advanced ceramic tools production facilities. Per Finne Umami Santoku Knife. Chroma type 301 Knives, design by F.A. PORSCHE. Stelton Pure Black knives by HolmbackNordentoft.